Poet Robert Burns was voted Greatest Scot of All Time in 2009. Burns was born in 1759 in a thatch-roof cottage built by his father and lived there for seven years, a hard life of farming and poverty. He went on to live a fast life of carousing and died at age 37. But that’s another story. The cottage is now a quaint museum; there’s even a replica in Atlanta, Georgia. 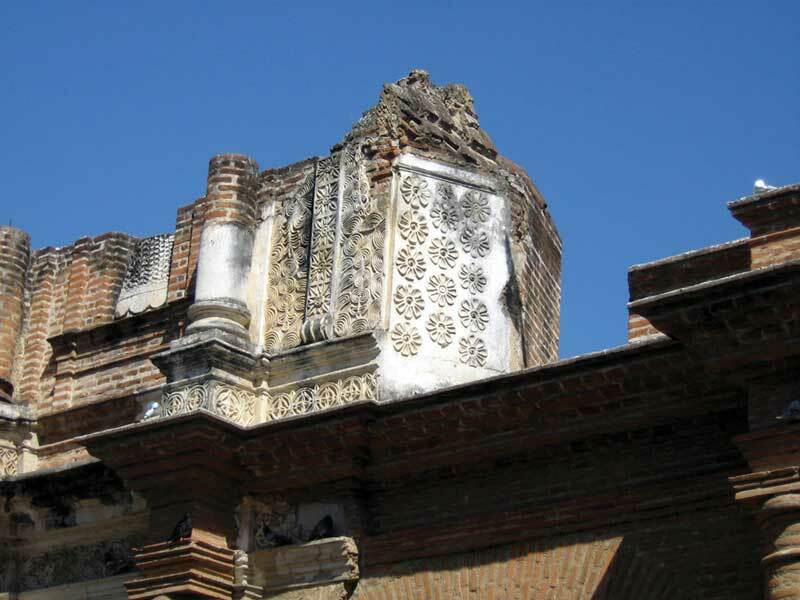 Two hundred-plus years before Burns was born, thatch-roof shelters went up all over in Santiago de los Caballeros, now La Antigua Guatemala. They are long since gone; but even if preserved, they would hardly be considered quaint. Similarities end with the thatch roofs and the hard life. 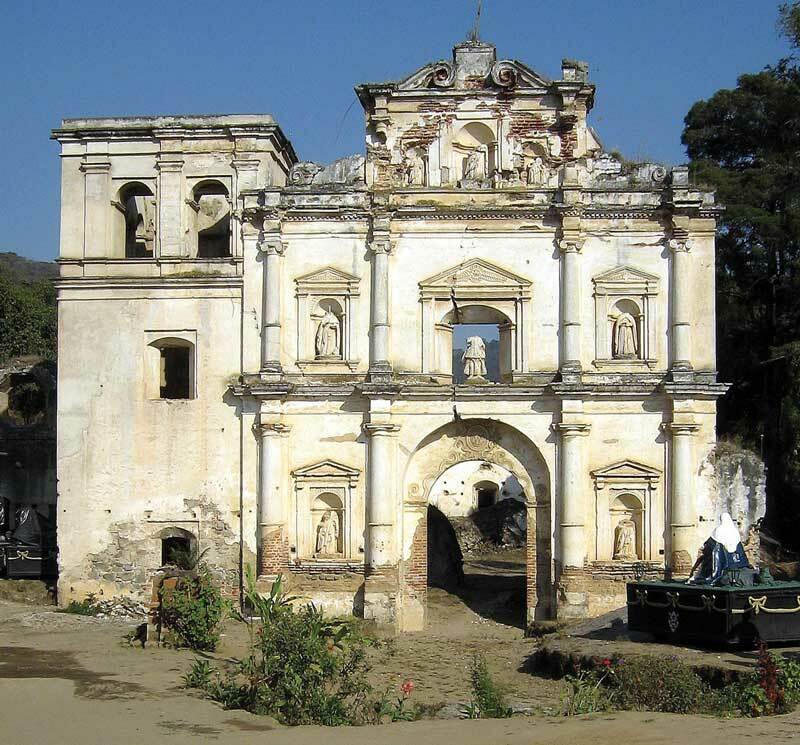 In 1541 survivors of the historic flood that destroyed Almolonga on the skirts of Volcano Agua, the previous site of the seat of the Spanish government in Guatemala, struggled and scrambled to rebuild their lives a few months later. They hurriedly put up provisional poles and cornstalks and sticks of any kind, all shelters with thatch roofs. The people were not well and able-bodied either. They had been traumatized and wounded; they had lost family and foundations. There was no international aid to helicopter in supplies and help. 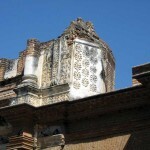 Certainly the fine architecture that graces the ruins seen today in La Antigua was not on the to-do list. The first order of business was to provide a place for mass for the workers doing the urbanization, such as it was in that time. 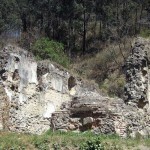 The site chosen for the Ermita de Santa Lucía (a chapel for the image) was at the southwestern corner of the new Santiago, at the road to Almolonga and off the official grid pattern layout so as be out of the way of the work in progress. Within months a church to serve as the temporary cathedral replaced the chapel, and in 1543 church authorities officially moved to the new city. 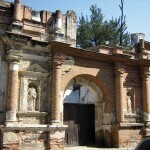 Interestingly, though, the Church of Santa Lucía was not the first to be built in the new area. 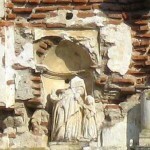 Coincidentally, not long before the disaster, a chapel for an image of Santa Ana had been provided for a village to the southeast. 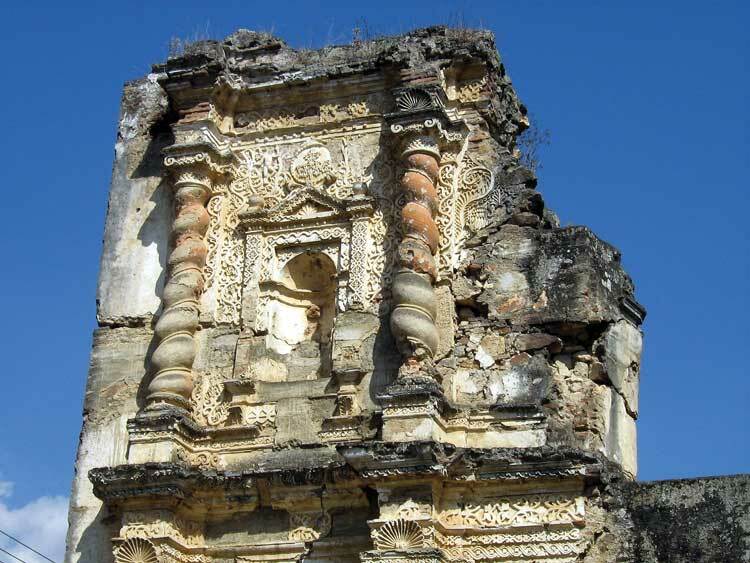 According to J. Joaquín Pardo in Guía de Antigua Guatemala, a small church was built in 1541, “…being this the first there was in the Valley of Panchoy.” The Church of Santa Ana has continued to this day, with various careful reconstructions that have retained typical colonial architecture. 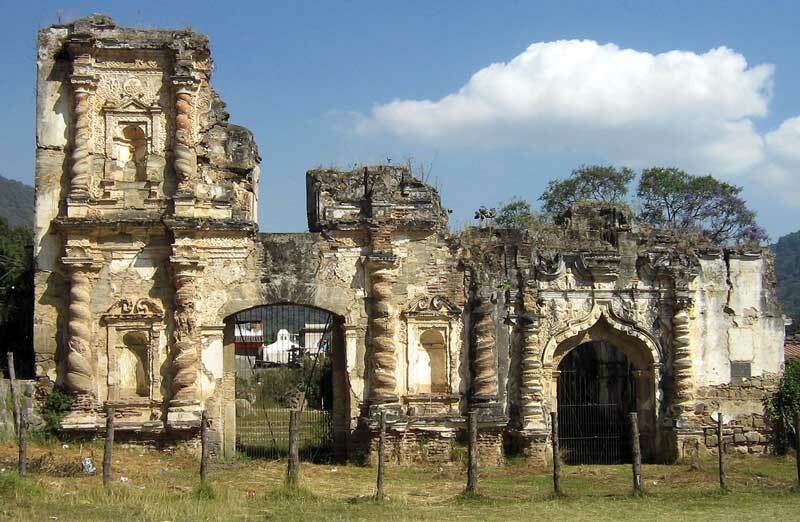 “Formal construction developed slowly due to few trained, experienced Spanish workers,” wrote Sidney Markman in Colonial Architecture of Antigua Guatemala. Even monks took up construction work to get the job done, “but also at times as a show of self-imposed humility.” Markman questioned the contribution of the indigenous population to the building process. Since all shelters—housing, churches, even monasteries—were originally of thatch, locals were put to work, but at the time they were not skilled in any construction trade and their numbers were few. Further complicating things were the New Laws issued from Spain in 1542 that freed slaves and relieved workers from abuse and injustices. 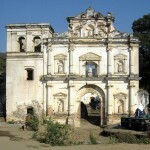 Indigenous populations developed outside the new town at its corners: Candelaria built in 1548 for farmers and artisans at the northeast, Manchén on the hill in 1565 for ironworkers and carpenters at the northwest, and Nuestra Señora de los Remedios in 1574 for rope and mat makers at the southeast. 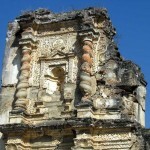 About that time the king instructed religious orders to spend more time and money on buildings “worthy of the newly introduced religion so that the Indians might be attracted to it and leave behind their heathen idol-worshiping.” Change began, with brick and stone becoming common in the 17th century. Tile and wood roofs replaced thatch; now as parish churches, residences for priests and large plazas to serve as marketplaces were added. 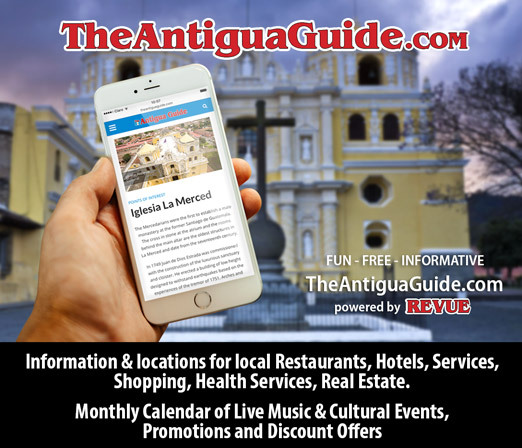 Santiago de los Caballeros experienced a building boom big time. 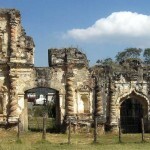 According to Domingo Juarros in Compendio de la Historia del Reino de Guatemala 1500-1800, by the end of the 17th century there were 38 churches, including 16 monasteries and convents. 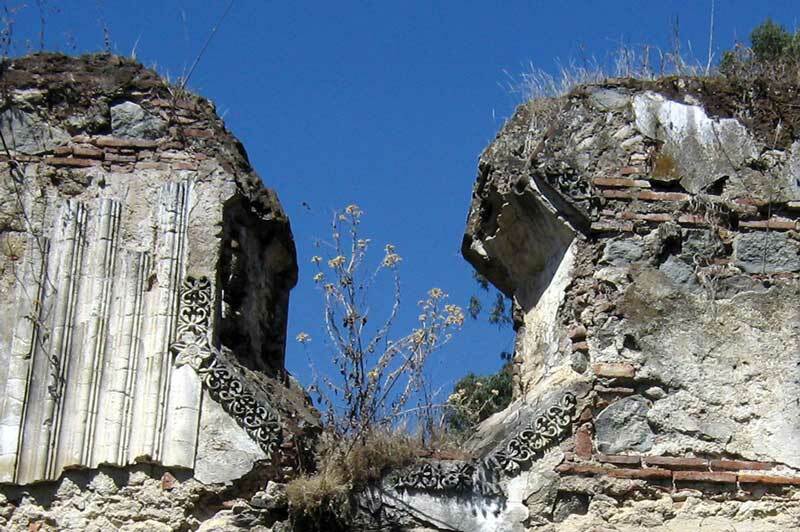 The northwest area grew so rapidly that the little Church of Manchén was replaced in 1580 by the larger Church of San Sebastián, down from the hill to where it would be less isolated and more convenient, at the north end of 7a avenida. 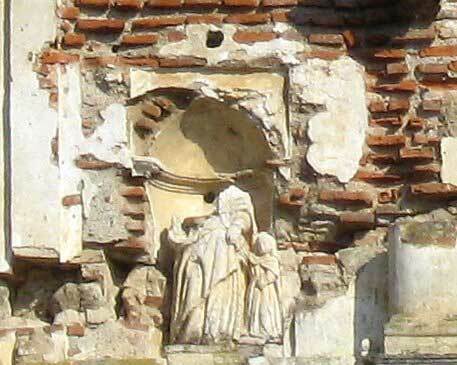 Denuded of plaster, the Church of San Sebastian reveals brick structure. 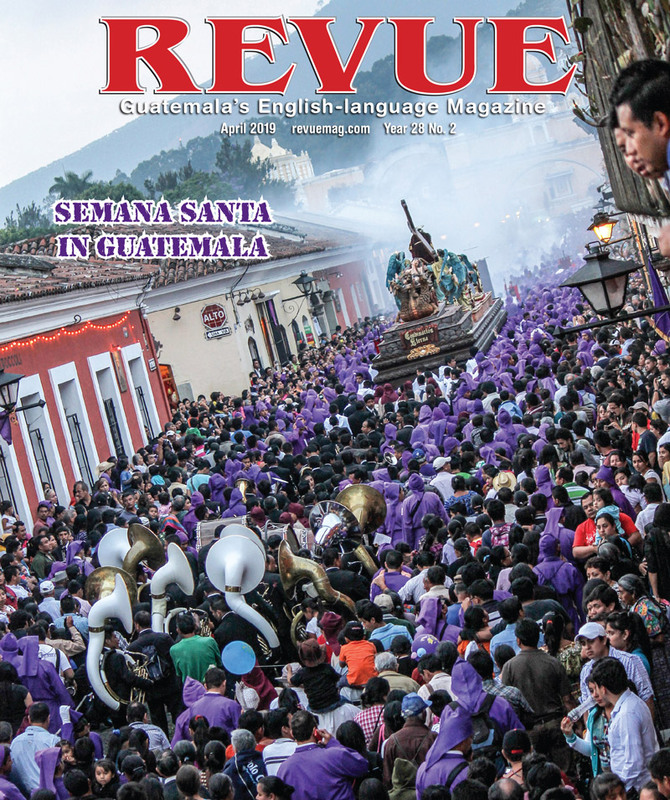 Franciscan recorder Ximénez wrote that the church had more than 8,000 parishioners by the end of the 18th century. 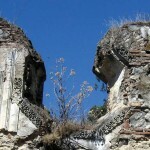 That was more than the cathedral, which served the Spanish population, whose properties were within the town plan. 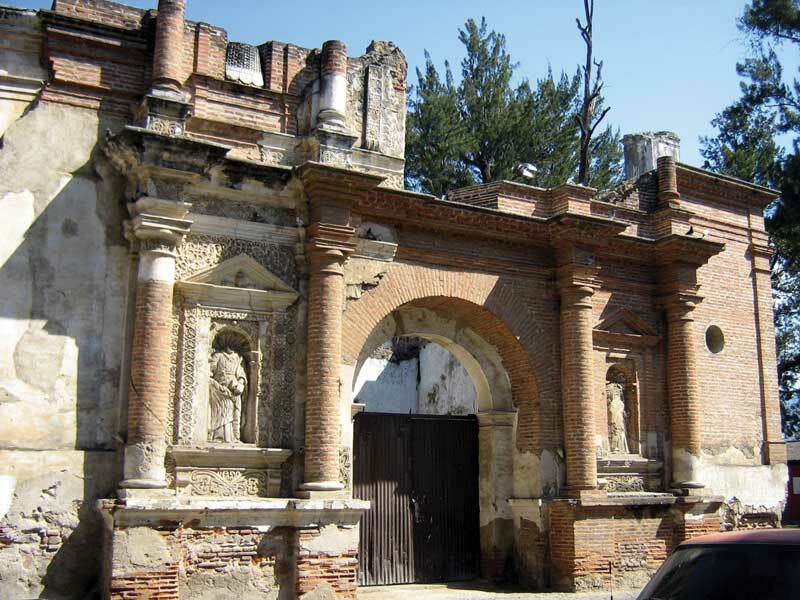 Having not suffered significant earthquake damage in 1773, the church continued until 1874 when the roof collapsed, a century after the town moved to what is now Guatemala City. 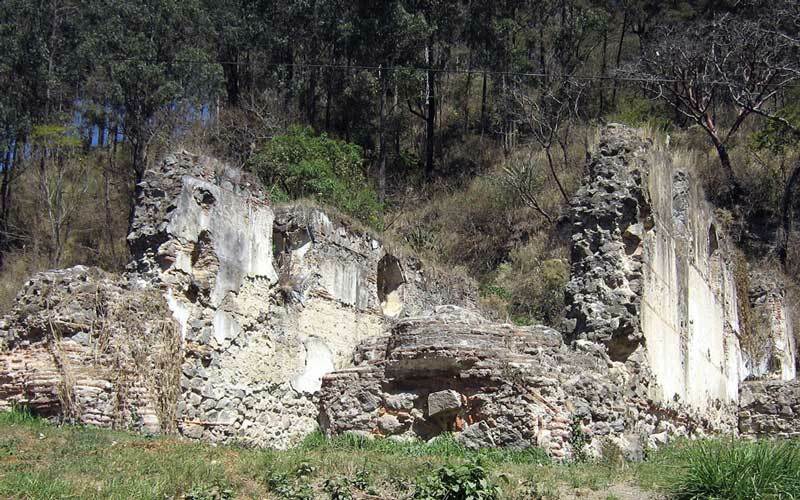 Figures are hard to confirm, but most sources agree that the population that moved from Almolonga in 1541, counting local workers, was about 5,000. It grew to about 30,000, beyond the original grid, and was running out of space as well as funds to support the religious institutions. Authorities became stingy with permissions to build. Fortunately, perhaps, religious fervor waned at about the same time. It had been 230 years and a long way from the thatch roof, improvised shelters. As nature dictates, all things run their courses, and the quakes of 1773 put an end to it all. Or, perhaps a new beginning. Love history, thanks for the story & pictures.